Our Hawaiian adventure began last March when our best friends invited us to go to Hawaii with them. They had enough frequent flyer miles to get all seven of us over there. 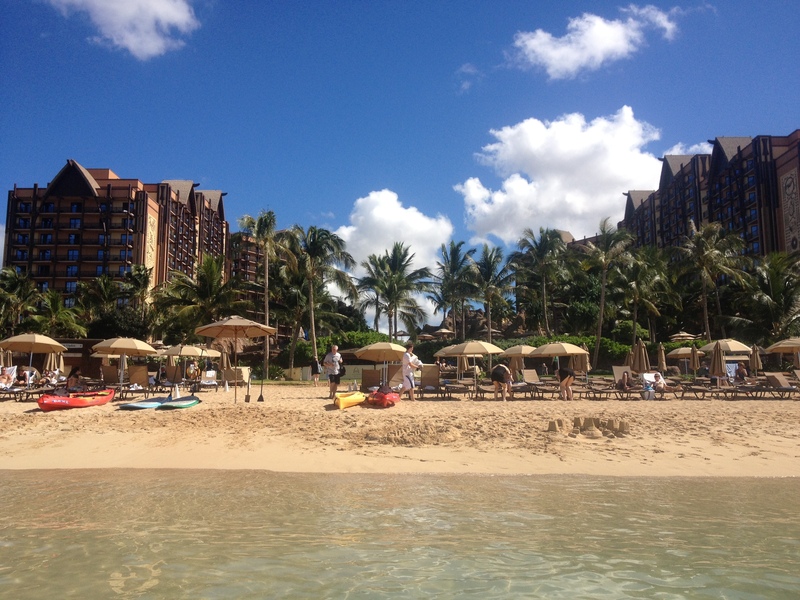 We had enough points for 5 nights at Aulani, they had enough for 2 nights at the Marriott Vacation Club. After pulling all of our resources we knew we could make it work! We began our vacation at the Marriott Vacation Club at Ko’Olina on Friday afternoon in a 2 bedroom villa. This was a beautiful resort. Very different from Aulani. The resort has wide open grassy areas and much less Hawaiian theming. The lobby is lovely, open air and welcoming. The first day we asked for directions to Diamond Head as valet pulled our rental car around. The employee at the concierge desk not only gave us a map but also a bottle of water for each member of our party. What a nice touch! I would recommend this hotel if visiting Hawaii, especially an all adult traveling party. On Sunday we moved to Aulani. We checked-in at 8:30 am as we were meeting friends on the North Shore at 10:00. Imagine our surprise when they said our room was ready! We made our way up to room 1450 of the Ewa Tower and could not believe our luck! We had a view of the ocean overlooking the pool and if you looked the other way we had a view of the mountains! I quickly realized we had the room I had read about on trip reports with the very large balcony. The room was perfect for our party of 7. It was a 2 bedroom dedicated. The master had one king bed and we moved the sleeper chair into the master bedroom. The second bedroom had 2 queen size beds. There are 2 1/2 baths and the couch also pulled out. Moving the sleeper chair into the master left the living area free of sleepers. This was just what we needed with our clocks being off 6 hours! Those who woke up early were able to go into the living area and balcony to have breakfast and coffee without disturbing the others. During our trip we made some outings on the island to Diamond Head, Manoa Falls, Hanauma Bay, the North Shore, Waikiki and other scenic areas. We had rented a van for less than $200 for the week. This allowed us to tour the island without having to pay the expensive excursion prices from the resorts. With a bit of preplanning this was not an issue at all and we saved thousands of dollars. Most of the outings are state or city run parks. Some have fees only for parking and others have a small fee to enter. An example is Manoa Falls. The Disney excursions costs around $100 a person. This includes a tour guide, transportation, a bottle of water, and hiking boots. We were charged $5 for parking only. We knew it would be muddy so we bought cheap water shoes before we traveled. We didn’t have a guide explaining all the flora to us but we did have a great time hiking and exploring! That being said, I do like to preplan and save money. The excursions would be great if you want to sit back and let the others do the planning for you. Our five nights at Aulani were wonderful. Included in our party was 4 40-something year olds and 3 children ages 10,14, and 16. There was something to do for everyone. Lets start with the pool area. The new expansion area was open. We never had trouble finding chairs together. Like most others we found the pools to be fun and the lazy river relaxing. We spent many hours in the lazy river, infinity pool, and infinity hot tub. There is now an adult only pool which is small. Plenty of chairs and 2 cabanas in the adult only section. I saw many couples without children relaxing there. I think it’s a nice touch for “more seasoned” DVCers and the many number of couples we saw on their honeymoon. Even in the off season the other pools were full of children splashing and playing. We spent lots more time in the lagoon than I thought we would. The way the lagoons were developed keep the big waves out which made it very easy for the kids. We rented from Makiki Joe’s Rental Shack 2 days. We rented paddleboards and kayaks. The stand up paddleboards were $30 per hour and the double kayaks were $20 per hour. Both kids and adults enjoyed the lagoon activities. This area also had plenty of chairs. My husband especially liked snorkeling in the lagoon out by the rocks. He even saw an octopus! Several in our party had sone the Rainbow Reef length of stay pass that was only $20. They could also use the Rainbow Reef snorkeling equipment in the lagoon. Our dining was limited to a breakfast at Ama Ama, the quick service restaurants, and the Olelo room. I thought the prices were very reasonable and not outside the norm for Hawaii or Disney. The new Ulu cafe had some nice offerings for a plate lunch and warm sandwiches. The only problem we ran into is my husband spent the last two days very sick from salmonella poisoning that we think came from the Olelo Room. He ended up at the Urgent Care getting an IV of fluids, moriphine, and antibiotics. The food and beverage manager contacted us after hearing of the illness (or as Disney calls it “the allergic reaction” from our restaurant). He stated no other complaints were made that evening but that’s the only meal I did not share with him for two days prior to him getting sick so we’re pretty sure we narrowed down the culprit. The manager was very apologetic. We enjoyed a few of the offerings from the free resort activities. The Starlit Hui is a must do! We did not do a luau while visiting but a nice dinner out and the Starlit Hui seemed just as good. The ukelele players were amazing. The kids participated in some of the teen events and community hall events. They reported back that they had a great time. They also enjoyed the Menehune hunt with the phones, especially the lobby hunt. The list of daily events is available in the lobby each day of your stay. Unfortunately we were unable to do all the activities we wanted to do since my husband spent the last two days sick but the ones we did were top quality. 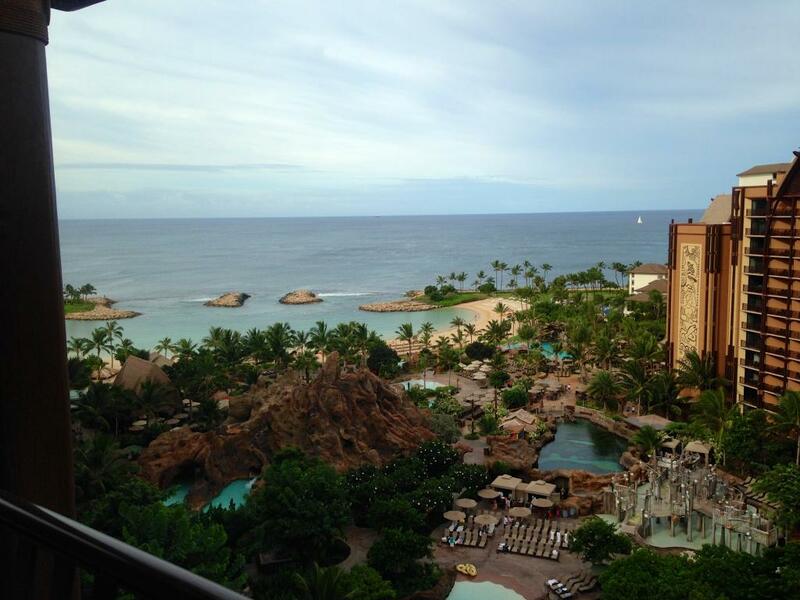 A few last thoughts on Aulani and Ko’Olina. -They are a distance from Waikiki and many of the activities on the windward side of the island but the beach is so uncrowded and beautiful I wold take the drive over staying in Waikiki any day. 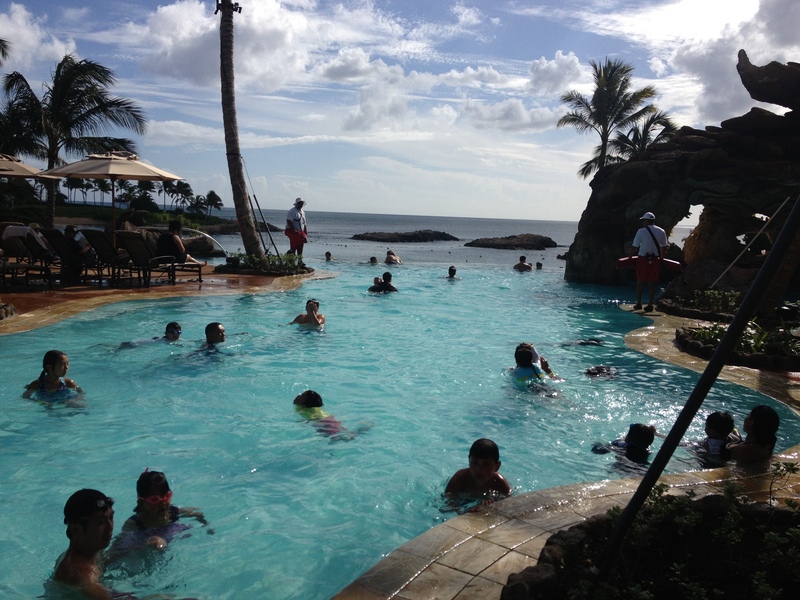 -Aulani is expensive but with the activities and childcare at Aunty’s Beach House it’s a decent bargain. -Don’t plan to stay in the resort the entire vacation unless you only have one or two nights. There is plenty to do at the resort but the experiences hiking and sight seeing were extraordinary. People keep asking if I would go back. The simple answer is yes. However it is a LONG flight from the East Coast and very expensive. I would like to go back one day but would like to experience some other places first. And of course, next year we will be vacationing at WDW. No matter how intriguing Hawaii was, I still missed my yearly trip to The World! If you would like to share your trip report, please send it to threestrandswdw@outlook.com. Previous Previous post: What a trip! Next Next post: Waiting To Go To WDW!